Sale secured their first victory at the Madjeski Stadium since October 2006 to leave London Irish four points adrift at the bottom of the Premiership. 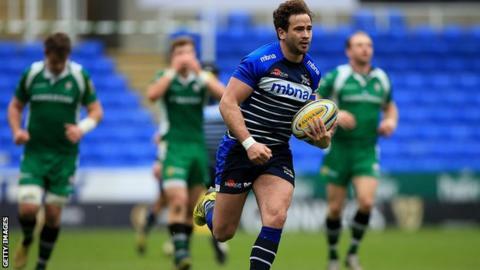 Danny Cipriani's penalty put Sharks ahead before Greig Tonks levelled and Sean Maitland's score made it 8-3. But Sharks replied through Cipriani and Mike Haley to lead 13-8 at the break. Cipriani's kick extended Sharks' lead before Johnny Williams' score gave Irish hope, but tries for TJ Ioane and Cipriani kept up Sale's top six push. Tom Coventry's side had lost just twice at home since November and were in touch at 15-16 on 70 minutes. But opportunistic tries for substitute Ioane and fly-half Cipriani, who contributed 20 of his team's 30 points, sunk the Exiles in the final 10 minutes. With three games of the season left to play, Sale remain in seventh place, four points adrift of Harlequins in sixth, who recorded a 46-25 victory over strugglers Newcastle. London Irish will travel to second-from-bottom Newcastle in a fortnight's time in a must-win match if they are to entertain any hopes of surviving the drop. "Bad fortune probably cost us towards the end. I thought there were two massive moments in the game. "One came from a forward pass from Danny Cipriani and the other from hands in the ruck that were missed by the officials. "We're just not a good enough team that we can rock through a game and let those opportunities go by. "We need everything to go our way and they were two big, pretty telling moments." "Fair play to London Irish, they're fighting for their lives. They gave it a pretty good crack and we've just edged them out in the end. "We made some basic errors, but we did just enough and turned around at half-time just in front." On whether a place in the top four is realistic: "We've got two games away and two at home to come. We'll see how we go. "The maths probably tells you the top four is out of the equation, but we'll give it a really good go. "It'll probably go down to the last game of the season at Newcastle." London Irish: Maitland, Fowlie, Hearn, Williams, Fenby; Tonks, Steele; Court, Paice, Aulika, Sinclair, Symons, Narraway (capt), Cowan, Treviranus. Replacements: Cruse, Smallbone, Halavatau, Sexton, McCusker, McKibbin, Brophy Clews, Mulchrone. Sale Sharks: Haley: Addison, James, Tuitupou, Edwards; Cipriani, Stringer; Lewis-Roberts, Taylor, Mujati, Evans, Ostrikov, Neild, Seymour (capt), Easter. Replacements: Briggs, Harrison, Cobilas, Mills, Lund, Ioane, Ford, Brady.